Standard C++ Foundation (Standard CPP Foundation in some databases that don't support + in names) is a Washington 501(c)(6) not-for-profit organization whose purpose is to support the C++ software developer community and promote the understanding and use of modern Standard C++ on all compilers and platforms. The Foundation is funded by sponsor members, book royalties, CppCon proceeds, and in the future possibly other sources. It uses these funds primarily to assist with running WG21 meetings, fund the next year's CppCon, pay isocpp.org website development and maintenance expenses, and in the future possibly in other ways that benefit the C++ community. The Foundation also serves to hold copyright, or a license, to all contributed contents of this site. Pearson Education (Addison-Wesley) has generously agreed to contribute extensive copyrighted book material to be made publicly available on this site and extended by wiki contributions. Reciprocally, we want to be able to authorize publishers like Pearson to republish such updated wiki contents, such as to produce revised C++ FAQs print books or e-books, which benefits the community by making the material also available in a convenient offline format that further helps disseminate accurate information about C++. Some entity has to exist to hold the license to the wiki contributions, and to execute an author’s agreement with Pearson to license Pearson to republish the material. 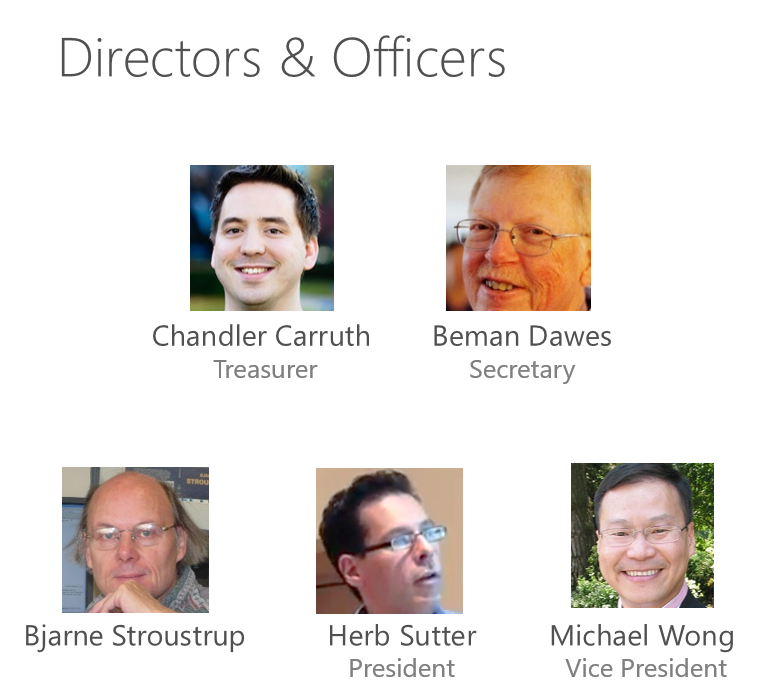 The directors and [officers] of the Foundation are as follows.